Eastern Canada —Earlier this year in May, an employee of a grocery store found something suspicious as he was stocking bags of potatoes. To his horror, he discovered metal sewing needles and metal nails had been deliberately inserted into the potatoes. Unfortunately, the residents of Eastern Canada were no strangers to such observations. In October of the previous year, there were several reported cases of sewing needles found in potatoes as well. This incident prompted relevant farms and the federal government to reevaluate their current food safety protocols and to determine if the existing equipment used for detection are adequate to uphold the standards for consumers’ safety. 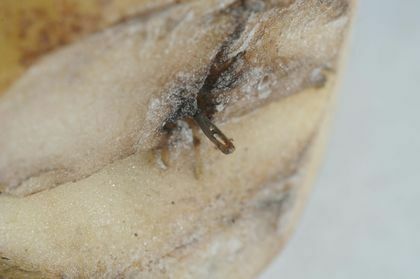 October 2014 —Metal needles were found in potatoes by customers, which were traced back to farms on Prince Edward Island. After a period of investigation, it was found that these potatoes had most likely originated from Linkletter Farms in Summerside, PEI. The CFIA has been working with the RCMP to find the culprit responsible for this horrible crime, but so far there have been no promising leads. Luckily, there were no reports of illness or injury. After the first incident in the fall, Prince Edward Island had already increased the sensitivity of its food safety measures to detect metal pieces. However, shortly after they implemented these procedures, they found more sewing needles in their facility in December of 2014. Fortunately, the tampered foods were discovered prior to distribution, so no recall was required for this time. May 2015 — Loblaws voluntarily recalled Russet potatoes belonging to Famer’s Market Brand and Strang’s Produce after an employee noticed needles in the tampered products. These products have been distributed to several stores within the company and they have since then recalled the potatoes from their shelves. However, this problem which was thought to be halted and contained in Prince Edward Island earlier this year, has now dispersed to Newfoundland and Labrador, New Brunswick, and Nova Scotia. The similarities of this food safety incident and the ones from late last year has brought more concerns to the involved parties. Fortunately, the metal materials were found before anyone got seriously sick or injured. Determined to find the culprit, Prince Edward Island’s potato industry has increased the reward for any information leading to the arrest of the person responsible for this heinous crime. From the previous $100,000, the reward increased to $500,000. Furthermore, the RCMP has released information stating that the tampered potatoes did not originate from the farm involved in the October incident. The repercussions of this incident has shown in the decrease of the public’s confidence in potatoes. The Canadian government realized that this is a disaster to the agricultural businesses in Atlantic Canada. They helped by providing $2 million in an effort to aid those farmers who have been devastated during this food terrorism act. The government also thought it was worthwhile to allocate funds to install new metal detection equipment to prevent such threats from occurring in the future. At this point, these cases still have not been solved. Personally, after following this story, I too have lost a bit of confidence in the safety of Canada’s food supply. Even though these tampered potatoes have not reached Western Canada, knowing that these dangerous metal pieces made it into stores intact, how do you feel about the safety of the foods we eat? I know a lot of companies installed metal detector in their food plants. They also make metal detector as one of the critical control point. In my experience in food plant though, what on paper and what actually happen might be different. This is why GMP is such a hard thing to implement in the food plant. A lot of production workers often ignore the warning signal of the metal detector, never hold the product, and never inform the HACCP team on what happen. I think most of the time, supervisors often emphasis speed over safety, therefore, workers have the pressure to finish all the orders in that day and result in such behaviors. Better surveillance within the plant should be implemented so companies will not ignore safety for money. Also, companies should emphasis more on training workers on the knowledge of food safety so they will be more aware of it. Definitely a very different and interesting article! I agree with Mandy’s point above, of how better surveillance, such has incorporating metal detectors into their production process can help better prevent such incidents from happening. However, oddly enough, as mentioned in the article, even after more strict metal detection systems were implemented into the production area, needles were still found after distribution! This, I find it particularly strange. It’s a good thing that these needles are able to be seen by the naked human eye, so that when a worker at the grocery store or a customer picks up the potato, they can see that it’s been damaged and know that it’s not safe for consumption. But I do worry, what if later on, it’s something else that’s placed inside a produce that cannot be readily seen by the human eye? Would implementing metal detectors at the level of supermarkets be helpful? This whole situation does seem a little funny to me though, because someone out there is actually taking the time to sneak around and deliberately place sewing needles into different potatoes. They must really have a lot of time to waste! It is very scared to know that metal needles can be found in the food products… When I worked in a bakery plant, every production line has a metal detector to check every box and ensure they are all metal-free before they go to the market. I wonder if those plants do have metal detectors on-site or not. If it’s food terrorism, it is more scared! I think the only way to lower the incidents is to set up metal detectors in the farm or plant for the final products, but it is hard to say after the products have been distributed. What customers can do might be checking the food products carefully before cooking and consuming. I may keep my eyes on the fresh produces from now on. Interesting title and article! It is surprising that this was not detected before in the farm-to-fork food chain. It is alarming and concerning that this kind of contaminations occur. The corresponding parties should take preventive actions to avoid this in the future. Like stated in the article, it makes people loose their confidence on consuming products. It is very interesting to know that, in addition to biological hazards, physical hazards caused by hazardous extraneous material also count for a large portion of “food terrorism”. Compared to foodborne pathogens, extraneous material could be more easily identified and eliminated by food manufacturers from food products. Metal detectors should always be implemented as one of the final steps in food processing plants to prevent possible metal pieces due to equipment damage. It requires everyone’s effort to fight against the “food terrorism”. I can’t believe someone would deliberately tamper with produce of all things. We often purchase food from the supermarket with the belief that the food has been properly inspected and had completed safety processing and tests, but we do not really consider what could happen to the food between the time of processing to the time it reaches the supermarket. Perhaps there should be another processing or screening procedure before the items are placed on supermarket shelves to further ensure the safety of the products? I actually have experienced this personally. That was a Korean restaurant, I ordered hot-stone rice then I found a small piece metal “net” (which I believe was part of the tap filter) in rice. I was so disappointed, because I liked that restaurant so much. Thankfully I did not eat that spoon of rice without looking at it that day. Even though they apologized and served me a new dish, but my mood of eating was ruined :(. I do wish I will never experience that again, finding a hair in food is even more acceptable than finding a thing that might hurt or kill me. Many farms lack security control over their premises which leads to food tampering. Farms and facilities should put in security measures such as preventing unauthorized entry to secure area, verifying background checks on employees and enforcing visitors’ policies. They should also put in adequate physical security such as fences, gates, good lighting and video surveillance cameras.